How Did Fireworks Become a 4th of July Tradition? Fireworks are a large part of the modern 4th of July celebrations. These fireworks are directly associated with the independence of the United States of America. Many people are unaware of the origins of using fireworks on July 4th. In fact, fireworks have actually been a large part of the 5th of July ever since the first Independence Day in 1776. The practice of firing fireworks at important events started long before the founding of the 4th of July. The Chinese were the first to invent fireworks, sometime between the years 960 and 1279 AD. The Chinese thought the loud sounds and sparkling colors warded off evil spirits, and they often shot them at important events such as Emperor’s birthdays and other Chinese holidays. Fireworks are credited with being brought to Europe by Marco Polo some time in the 1200s. After their introduction, the English often used fireworks to celebrate birthdays and other special events. The first time fireworks were used to celebrate July 4th was on July 8th, 1776. 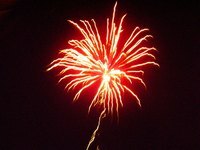 According to History.com, some of the fireworks used may have been used mockingly, because in England fireworks were used as a birthday celebration for the kings and queens. Firing the fireworks to celebrate the separation of the colonies from England was to some the celebration of the “death” of the king’s power over them. The next year, on July 4th, 1777, the first official July 4th celebration was held. This day was celebrated with the firing of guns, cannons, bonfires and fireworks. Philadelphia was the first city to celebrate July 4th in this manner (which was the capitol of the United States at the time). Other cities soon took up the practice of firing guns and fireworks on July 4th as well. July 4th was not declared an official federal holiday until 1941. Before then the 4th of July was still celebrated around the country but in a less official capacity. Once July 4th was named a federal holiday, more people than ever started using fireworks as a part of their Independence Day celebrations. Today, nearly everyone celebrates July 4th with fireworks of some kind. Almost every city in the country has its own special July 4th fireworks displays. Families use sparkers and firecrackers at their own homes to celebrate our nation’s independence. Firework stands are typically only open two times during the year: once around January 1st and once around July 4th. How Does Canned Tuna Stay Fresh?